Do you need to get your turkey set up for that perfect shot, but you are not sure how? When it comes to successful turkey hunting skills, finding the perfect turkey set-up is key to being a successful hunter. There are many small considerations when it comes to finding and maintaining the perfect turkey set-up. Here are some important tips for improving your turkey set-up so that you can improve your success in the woods. Part of establishing the perfect turkey set-up is doing your homework. In fact, if you take the time to research and scout before the big day of the hunt, you will find that this small bit of preparation can make all the difference. The day before the big hunt, take the time to scout out of the location where you will be hunting and shooting. Spend the afternoon before you go hunting to check out the location. Late afternoon is the best time to go scouting. What exactly are you looking for during your turkey location scouting expedition? You will want to look for signs of turkey activity. The biggest and most obvious clues you will ever come across are turkey sounds. If you hear turkeys, or what you think are turkeys, somewhere in the vicinity, there are probably gobblers in the area. Almost everyone can recognize the distinctive gobble of a turkey, but there are other sounds that you will learn as you become more familiar with turkey hunting. During your scouting expedition, you will want to scout in late afternoon, at least until nightfall. Your goal is to be around when the birds are flying up to the trees to roost for the night. Thus, you will want to be in the woods in evening, at nightfall. If you suspect that there are turkeys in the area, but you aren’t sure, there are some things you can do to make sure. In general, the best way to determine if there are any turkeys in the area is to call to them. You don’t have to make any complicated calls, as you just want to verify the turkey’s presence in the area. Thus, you can elicit a response simply by hooting like an owl, or just crowing. If you don’t hear anything, this doesn’t mean automatically mean that there are no turkeys in the area. However, if you do hear a response, you know you have found the perfect location for a turkey-hunting set-up. Make a note of the area where the turkeys are roosting for a fruitful day of hunting. 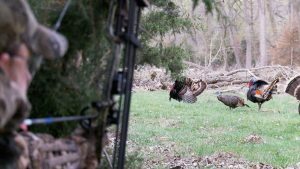 One of the most important parts of setting yourself up for turkey hunting is use effective calling techniques in a the right location. Practice and cultivate a good box call or slate call. During mating season, a good yelp works well for attracting male turkeys. As for creating the ideal set-up, you should place yourself in the best possible position when taking aim. The best position should ideally find you on equal elevation between you and the turkey. Always avoid calling a turkey downhill or uphill. Both of these positions are not known to be very productive. Here are some tips that will help you approximate the best possible set-up during turkey hunting. Using a tightly choked 12 gauge with a number 6 premium has been known to be very effective. Load about a 2-¾ inch of shot. For clean kills under 50 yards, these are your best bets.